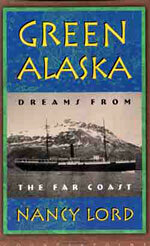 This creative nonfiction book, published on the one hundredth anniversary of the Harriman Alaska Expedition, provides an impressionistic account of that scientific and exploratory expedition in juxtaposition with Nancy Lord's own travels in coastal Alaska. Nancy was drawn to the Harriman Expedition as subject matter largely because two of her favorite writer-naturalists, John Muir and John Burroughs, were part of the two-month, 9000-mile steamship trip along Alaska's coast. The lesser-known of the two, Burroughs, serves as a prominent "character" in Nancy's account of the earlier journey and as she contrasts circumstances and attitudes of the two eras. "This book was a lot of fun for me," Nancy has said. "I got to study and imagine some of my favorite historical people and to think about what changes we've seen over the last century and what we've done, and might do, to maintain--or destroy--Alaska's natural and cultural treasures. The short chapters felt like little meditations, where I could pull together individual moments with some reflective thought." "An exotic, ruminative blend of travel, nature writing and ecological outrage. . . Lord uses the Harriman expedition as a springboard for a challenging meditation on white Americans' pioneering and westerly impulses—and on the arrogance that so often has left chaos and ruin in their paths." "A beautifully written contribution to what might be called the literary history of science, on a par with Ivan Doig's Winter Brothers and Barry Lopez's Arctic Dreams." Green Alaska was nominated for the John Burroughs Medal for distinguished nature writing and was featured by Barnes & Noble in its Discover Great New Writers series. Nancy appeared as a guest on NPR's Living on Earth on June 18, 1999 to talk about Green Alaska. Read the interview with Steve Curwood.